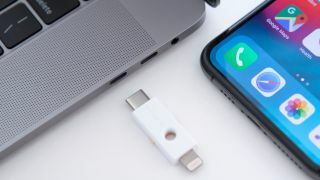 At CES 2019, Yubico announced the availability of its Security Key NFC and previewed its first YubiKey with a Lightning and USB-C connector for iPhones and iPads. The company's Security Key NFC builds upon its blue Security Key Series by adding near-field communication (NFC), in addition to its USB-A interface, for two-factor and tap-and-go authentication. The new device supports authentication for FIDO2/WebAuthn as well as U2F services on computers as well as supported mobile devices. The Security Key NFC is compatible with hundreds of websites, services and applications including Microsoft, Google, Facebook, Twitter, Dropbox and password managers. Yubico's latest security key is now available for $27 from its online store. Yubico also previewed its first device with support for Apple's Lightning port for use on iPhones and iPads. The new security key also has a USB-C port which allows it to work with the latest MacBooks as well to provide seamless authentication across desktop and mobile devices. The company also formally launched its YubiKey for Lightning Program as an extension of its Lightning Project announced last summer. Developers and services interested in supporting Yubico's security keys on iOS can now apply for the YubiKey for Lightning Program to enable hardware authentication in their apps.